Live in doom if you don’t read this… | Pulp and Circumstance, Juiced. If you are a regular reader of the New Yorker magazine, you will be pleased with the Sept. 21 edition, which I just finally plunged into after weeks of too busy to take time. 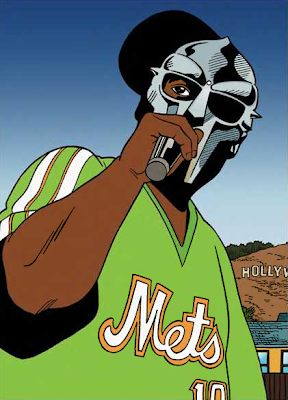 In the glossy pages is a brilliant feature of the life, times, and career trajectory of one of my favorite rap artists, Doom, formerly known as MF Doom, or by given name Daniel Dumile. Doom provides some interesting bits about his early years and his feelings on rap music, its changing tides, and why he wears that mask. The reason? So he can “control the story”. There’s some details on 3rd Bass and “The Gas Face” helping to beak Dumile and KMD, as well as the period directly following, when rap was highly commercialized and Doom receded into private life. Thanks to this delicious surprise in the pages of one of my favorite magazines, I have had Doom on repeat, particularly his early work with 3rd Bass and KMD, particularly “PeachFuzz”, which turned into a pretty descent hit for KMD. This entry was posted in jwolf and tagged doom, kmd, mf doom. Bookmark the permalink.